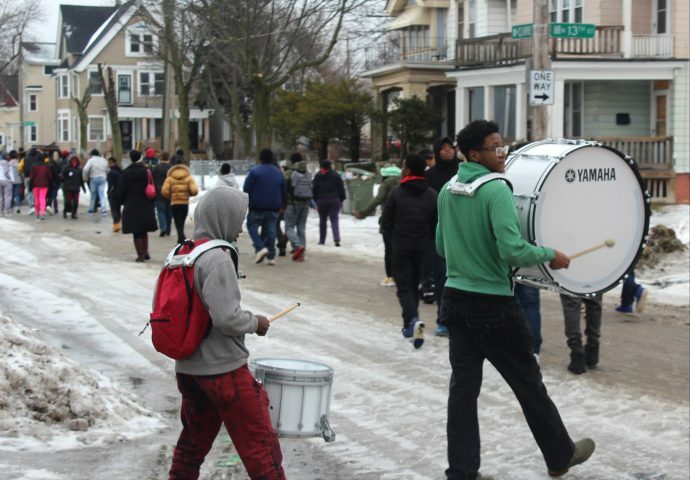 A beating drum accompanied by chants of, “No justice, no peace!” and “Whose streets? 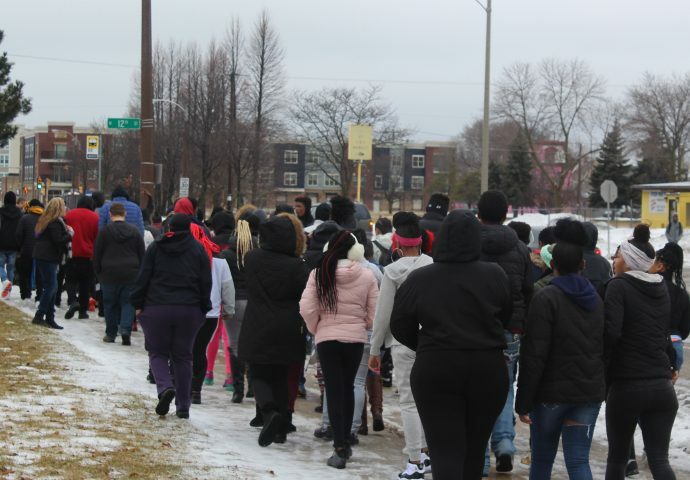 Our streets!” echoed down Center Street on Wednesday morning as nearly 200 students marched to support the Black Lives Matter movement at North Division High School. 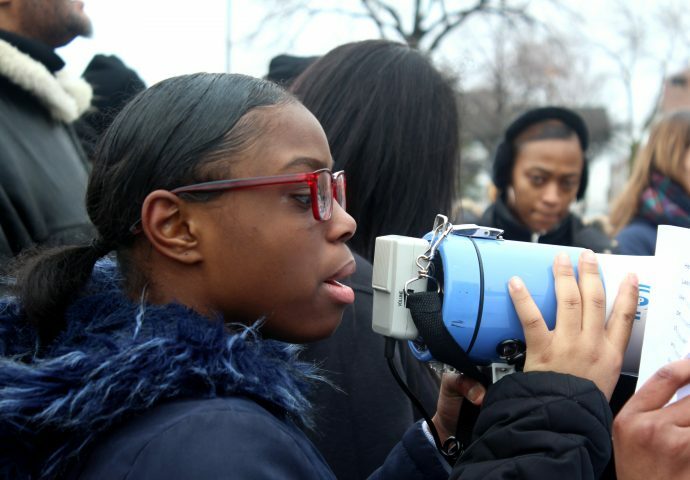 “We’re out here to show our neighborhood and our community who we are, that we’re a united front, that we matter and that we deserve to feel safe in our own skin,” said Aaliyah Rave, 15, a student leader with North Division’s chapter of Leaders Igniting Transformation (LIT), who organized the march as part of Black Lives Matter at School Week of Action. 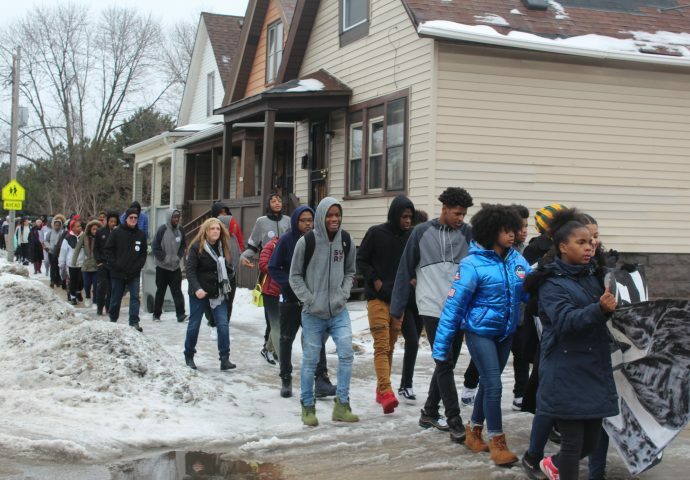 Many students sported black hoodies and buttons that read, “Black Lives Matter,” as they walked the ice-coated sidewalks of the block surrounding their school. 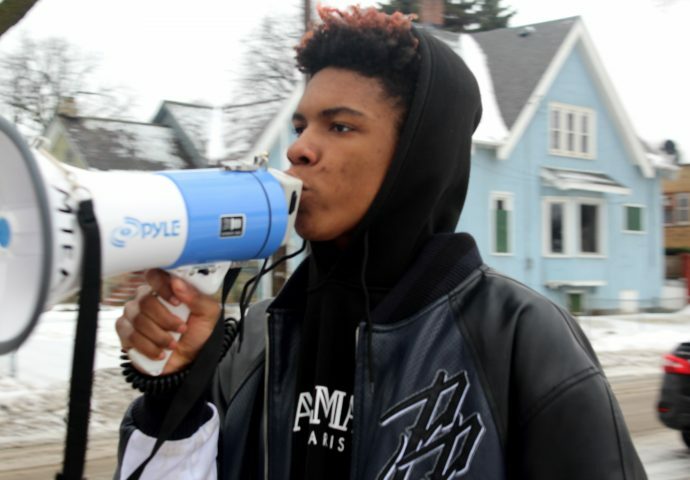 Ajaivien Knight, a 17-year-old junior, grabbed a megaphone from his friend and yelled into it, “Say it loud, say it clear, Black Lives Matter here!” He said he decided to join the march because he is frustrated by police brutality and gun violence in his community. 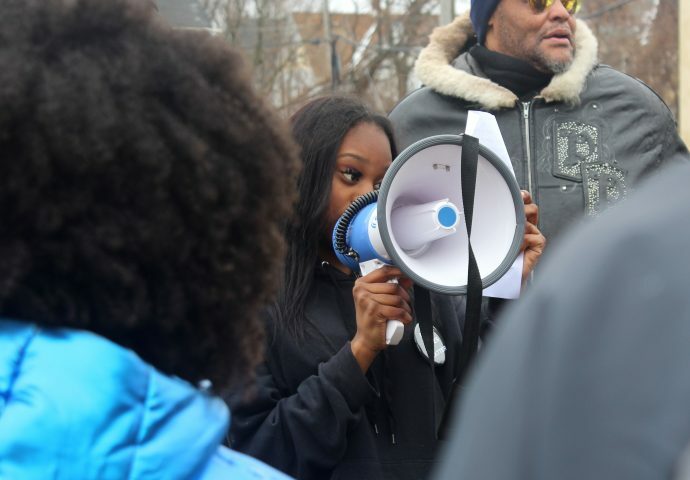 Akeira Smith, 18, is a senior at North Division, and she said she decided to march because she wants to take action to improve her community for the next generation. 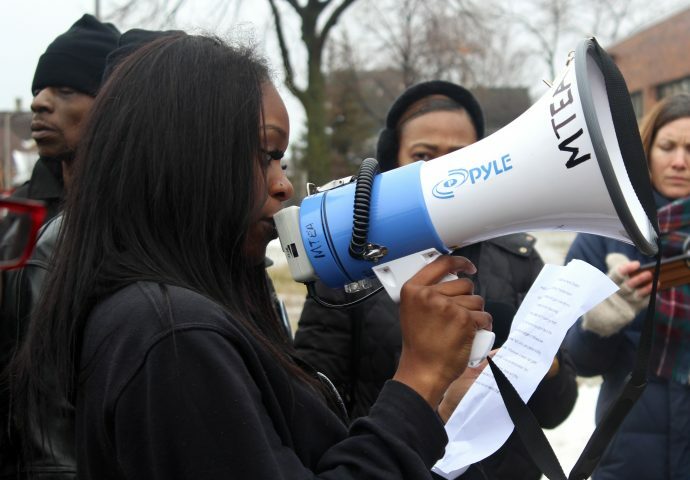 Several student leaders from LIT gave speeches at a rally following the march. 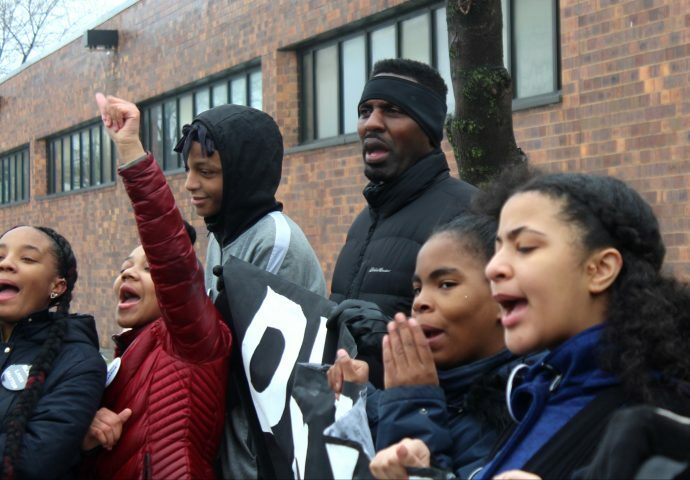 In addition to the march, students and teachers planned a week of activities including workshops on the history of fair housing, a poetry slam and a soul food celebration to educate students about the Black Lives Matter movement and provide opportunities for students to take action. Some teachers showed documentaries or included related articles in their lesson plans for the week, the ACLU is offering “know your rights” sessions for students, and there is going to be an all-school assembly about the school to prison pipeline. “North Division was the hub of the Civil Rights Movement back in the day,” said Gina Jorgensen, an art teacher and staff adviser to LIT. She said that the LIT students know that history and are trying to live in that legacy with the work they are doing. 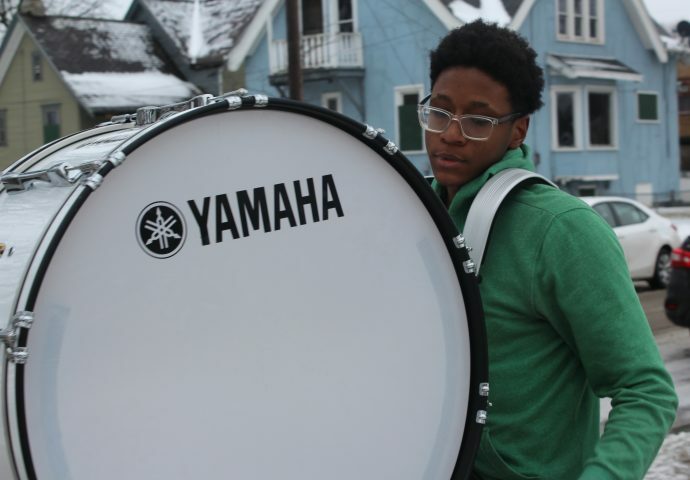 In the past, they raised awareness about lead in the water at the school, organized to get filters on the water fountains, registered students to vote, and canvassed before elections. 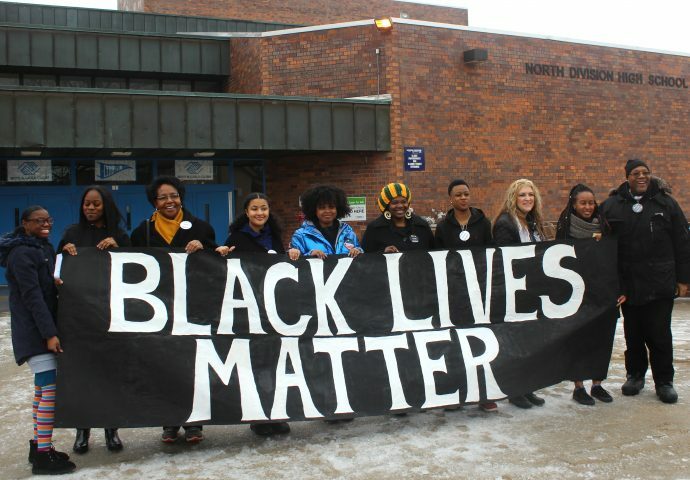 “We want to give the students an opportunity to stand up for justice and to become leaders,” Jorgensen said. 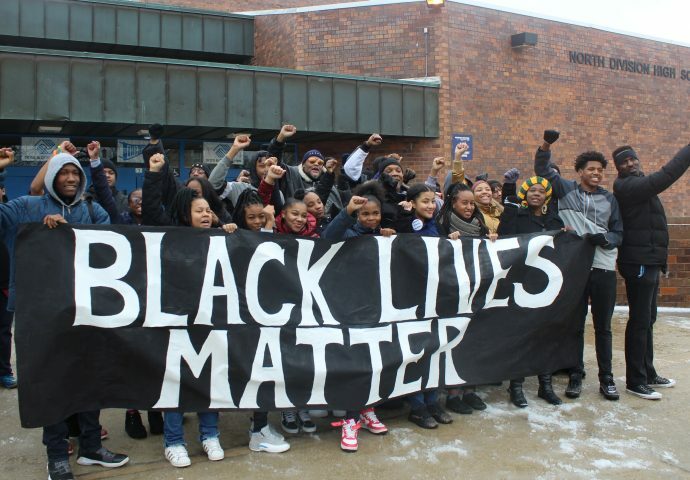 Milwaukee Public Schools is promoting Black Lives Matter in School Week of Action throughout the district, with a different event each evening, as part of Black History Month. Various schools across the city are also celebrating in their own way, similar to North Division, as well as districts nationwide. 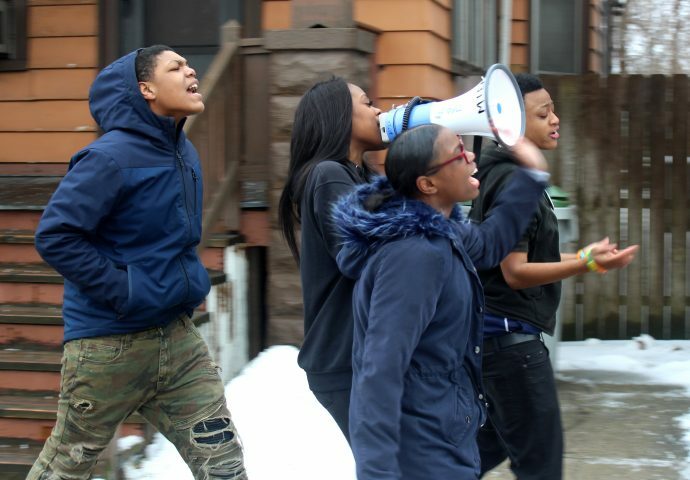 “This week is important because we need to come together as the black community and show that we value our lives and demand that others value our lives as well,” said Jashanti Johnson, 15.